Several models of replacement firing cards are available designed to retrofit or upgrade older analog dimmers. Digital models includes onboard software that ensures a reliable and accurate high-speed dimmer response. 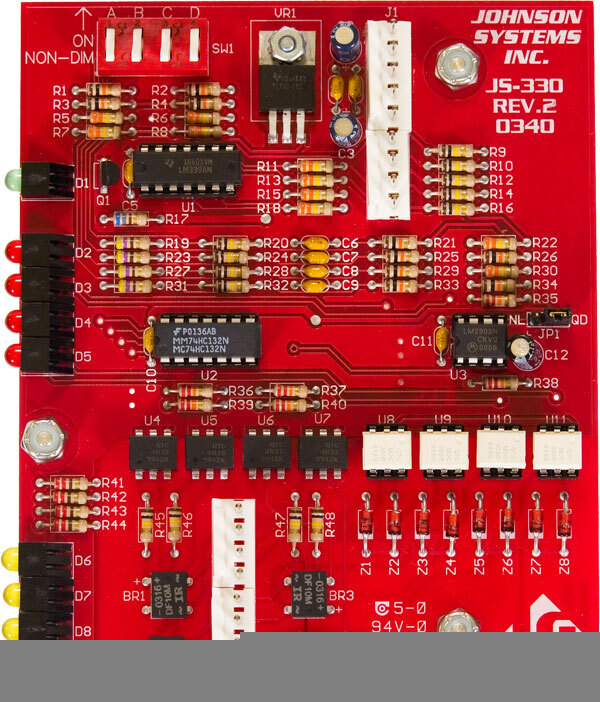 Features offered include SCR, Triac, SSR (solid state relay) and non-dim Relay driver outputs, LED status for power, control and load, curve select, load preheat, line voltage regulation and much more! Digital models will operate from 85 to 265 volts at 50 or 60 Hz, thereby allowing universal application. Economically priced, this expanding range of product is VERY different from all competitive models! 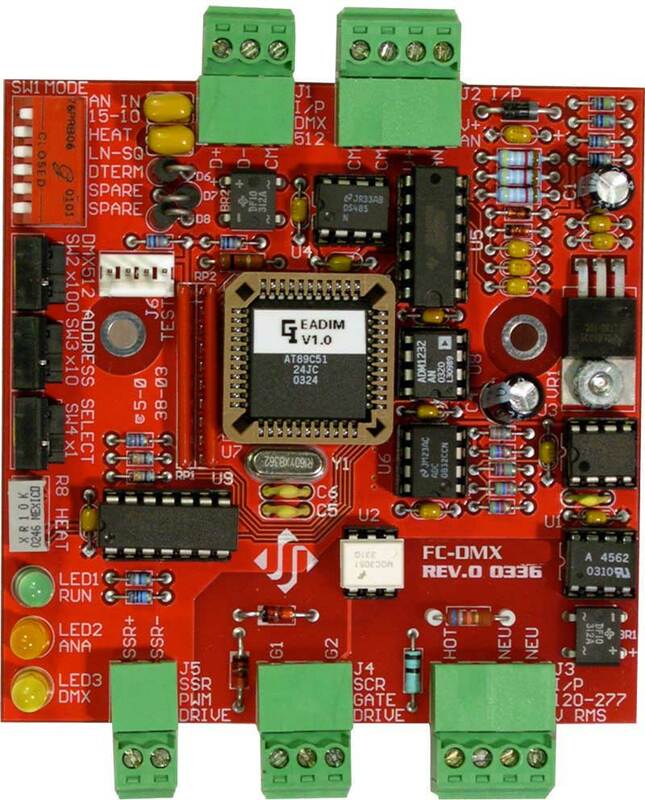 (Click to enlarge...) FC-DMX Universal Digital Firing Card. DMX and/or analog input (MERGE). SCR or SSR (PWM) drive applications. (Click to enlarge...) FC-MACRO Firing Card. Direct replacement firing card for Macro dimmers. SSR (120V) or SCR (277V) output drive. (Click to enlarge...) FC-22AB-SCR Universal Analog Firing Card. SCR and SSR drive outputs. (Click to enlarge...) FC-22AB-Triac Universal Analog Firing Card. Digital replacement firing card for analog input and Triac drive applications. (Click to enlarge...) FC-ADC-1 Universal Analog Firing Card. (Click to enlarge...) FC-445 (with front of dimmer on the left side). LED status indicators line up with the frame "trim" holes. (Click to enlarge...) FC-233 (with front of dimmer on the right side). Electro Controls Modular dimmer replacement. Replaces PCB's 231, 232, 233 and 328. Pin to pin compatible with OEM wiring harness. Selectable 10 or 15 VDC input. (Click to enlarge...) FC-330 (with front of dimmer on right side). Electro Control Quad dimmer replacement (4 channels per card). Designed for use with or without the QD-2000 rack electronic retrofit. Improved design for accurate LED display of phase reference, control and load levels. EC Quad dimmer support parts. (Click to enlarge...) FC-433 Non-Dim Relay. Designed for switching non-dimmed loads via analog DC. Ideally suited for control of AC fans, fluorescent lighting, etc. Rated for 50 Amps at 120 Volts. Higher ratings available. Built in "offset" activates relay above 1.5VDC. High input impedance for very low power input trigger requirement. FC-DMX Universal firing card. 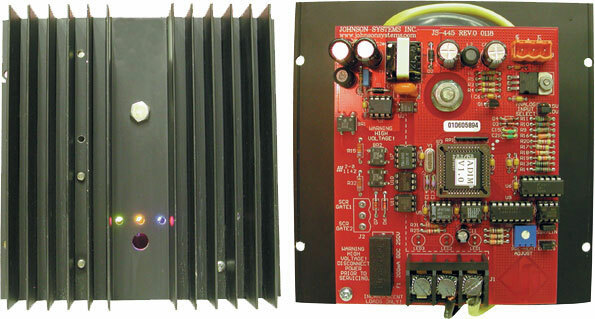 DMX and/or analog input (HTP) SCR or SSR (PWM) drive applications. FC-MACRO Direct replacement firing card for Macro dimmers. DMX and/or analog in. SCR or SSR output drive. 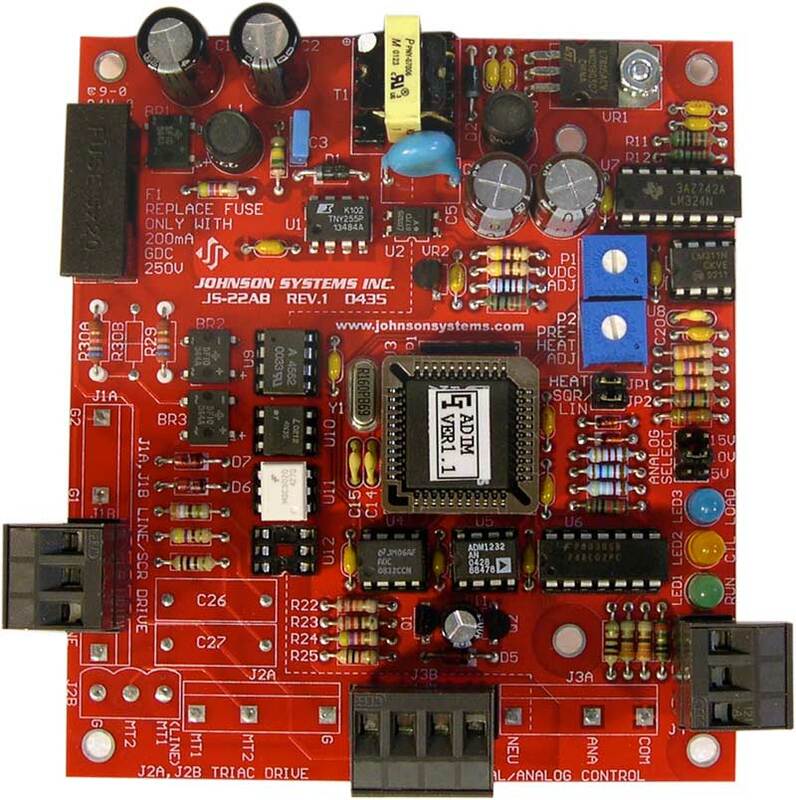 FC-22AB-SCR Digital replacement firing card for analog input and SCR drive applications. 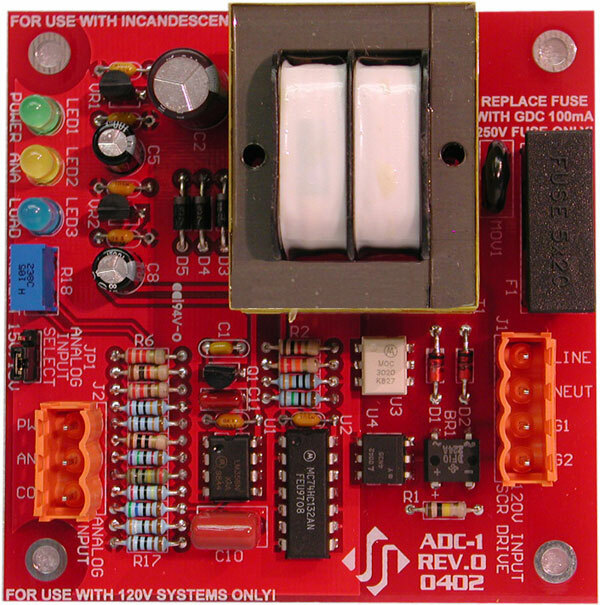 FC-22AB-Triac Digital replacement firing card for analog input and Triac drive applications. 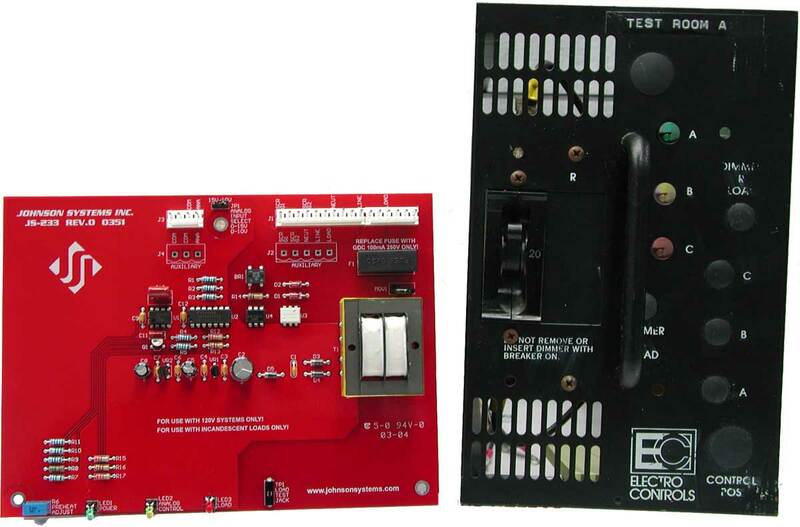 FC-22EC Bolt-in Digital replacement firing card for most Electro Controls and Control Lighting analog dimmers. FC-445 EC Alpha Digital replacement firing card for Electro Controls and Strand architectural "Alpha" dimmers. FC-ADC-1 Universal analog firing card. SCR or SSR output drive applications. FC-233 EC Modular Direct replacement firing card for Electro Controls Modular (black face) dimmers. FC-190 Strand JTM Direct replacement firing card for Strand "JTM Series" dimmers. FC-330 EC Quad Direct replacement firing card for Electro Controls. "Quad" (silver faced) dimmers. 4 channels per card. FC-PWM Driver Digital solid state relay driver for final dimmer stage interface. Contains power and control signal/level LED indicators. Simple proven design can be supplied in virtually any form factor. 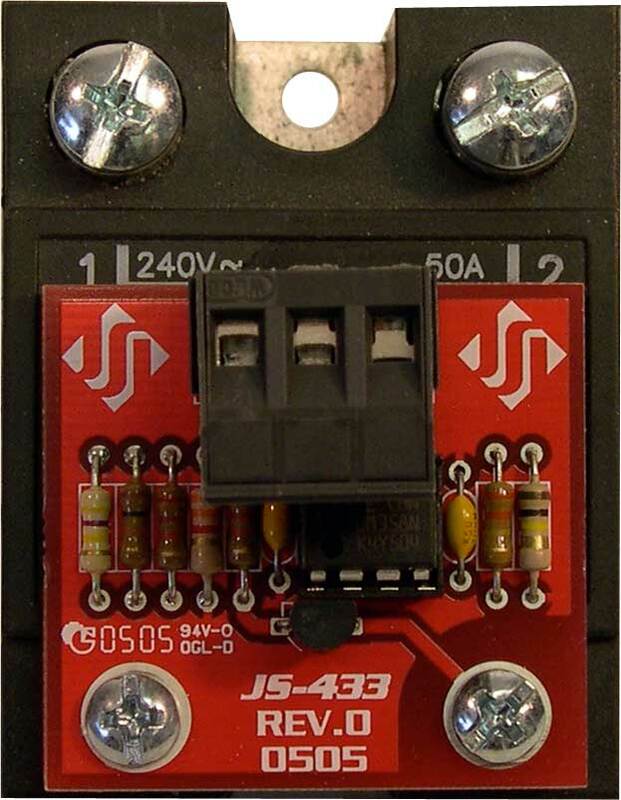 FC-433 Analog controlled relay for control of non-dimmed loads. Rated at 120 volts 50 Amps. Other ratings available. NOTE: Custom PCB layouts and designs are available for O.E.M. applications by others. Please contact the factory. Johnson Systems offers many other derivatives of the above designs. Custom PCB layouts and designs are available for OEM applications by others. Please contact the factory.